It’s hard enough moving house, let alone country…let alone moving to a new house in a new country with furnishings that just don’t seem to work! Can you imagine the despair?! We were approached by a family of 4 living in West Hampstead to help them with their home. They had recently moved from Dubai and had since moved the majority of their belongings over to their new home in Hampstead. They were lucky enough to enlist the help of NW3 Interiors to get on the case because although we have a our own style we can also adapt like little interior designer chameleons and exert our knowledge onto other styles and interiors. We started by discussing with the client their style, what they would like and what they would need. 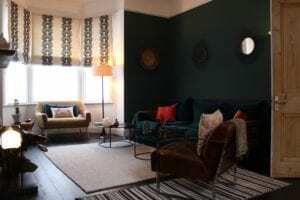 One of the main issues for us to solve was to figure out a way to integrate their existing furniture, which was an eclectic mix of middle eastern furnishings with bright colours and eccentric patterns into a period, West Hampstead home. Another one was to utilise a small existing outdoor area and make it a useable and functional space, as well as making it super duper pretty… (always). Our boldest statement and design solution was to stain the wooden floor almost pure black. This created a beautiful base colour for all of their statement pieces to pop, working in contrast with all of the patterns and colours allowing their stunning pieces to flourish in the space. We continued the black flooring from the front door to the back door and even to an outdoor space, allowing a seamless flow throughout the home. We also replaced the white framed doors in the kitchen with large glass panelled doors with black frames to frame the view of the garden. The doors were to designed to be pushed back and opened up to allow them to connect the garden and the kitchen in the summer time. We solved the awkward space between the two rooms were also connected by a black wooden flooring that helped to connect the two rooms and created a beautiful little space perfect for a book and a side table, perfect for outdoor reading. We installed bulb lighting that was spread up and across the wall and over-head to create a magical outdoor area. The client is really happy with the service and result, see the review on our Houzz page. If you’re considering changing your home for the better, get in contact here.